- to flash THE LED when the second hand reach 12 Hours indicator! 1) if an Hour Signal was provided by a Radio Station and the second hand is between 31-59 seconds...the 8 HOUR BUTTON will simply RESET the second hand to the correct time! 2) if an Hour Signal was provided by a Radio Station and the second hand is between 01-30 seconds...a push on the 8 HOUR BUTTON will frozen the second hand + the LED indicator will flash EXACTLY the number of seconds remaining until the CORRECT TIME!!! After that moment the second hand will start to move again!! PS. I already know that was already available a Seiko Cal. 3922/3923 in 1972-1974 with a pulsating power indicator light (LED), but those watches HAVE NOT a QUICK TIME SETTING button/approach! 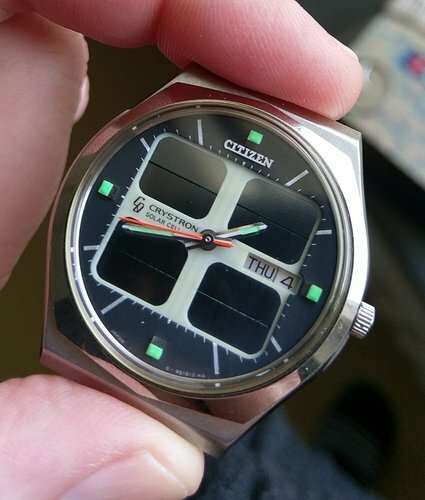 Since I have seen an unexpected accuracy (less than 3-5 secs/month in the last 2-3 months) of this early Citizen Crystron Quartz watch with flashing LED with 8600 movement (cca 1975), I have started to do some online searching about the Citizen 8600 Quartz movement from 1974-1975. 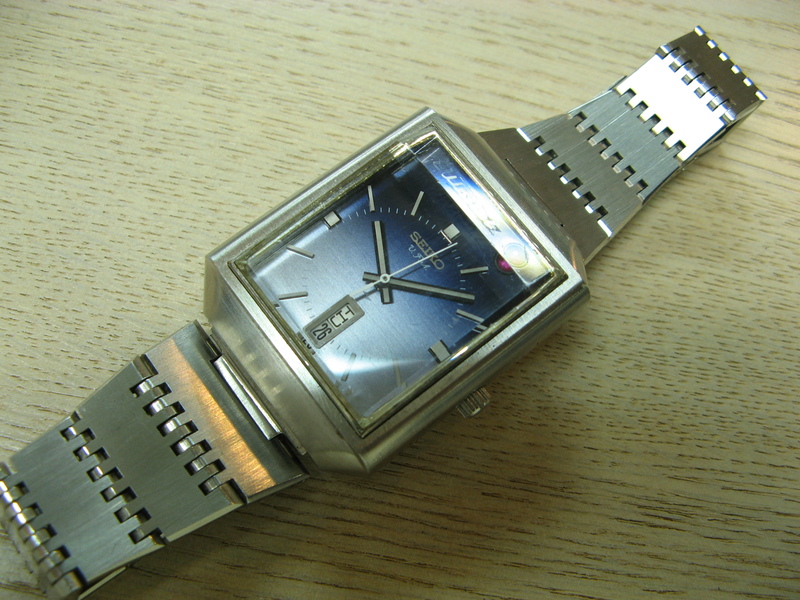 "The first quartz watch to be released by Citizen in 1973, calibers 8810B E.F.A., 8811B and 8821B. Caliber 8810 has an extra fine accuracy (E.F.A.) of five seconds a month. Special attention should be given to the bayonet-catch on the back of the watchcase." 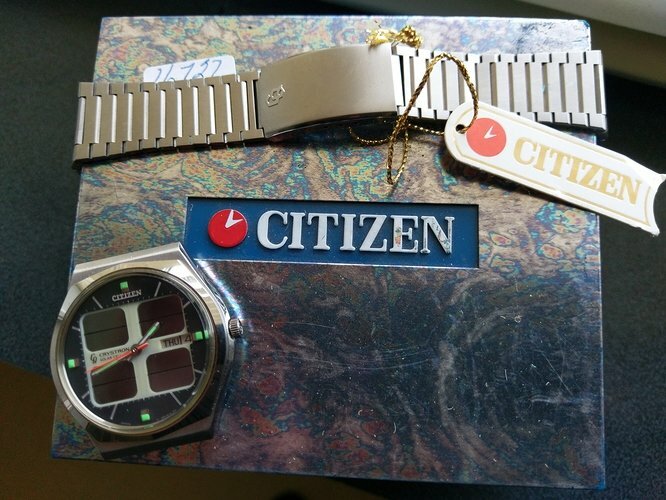 Please look at the amazing similarities in the design of the above pictured and EARLY Citizen Quartz movements - 8600A versus 8650A - from cca 1975!!! 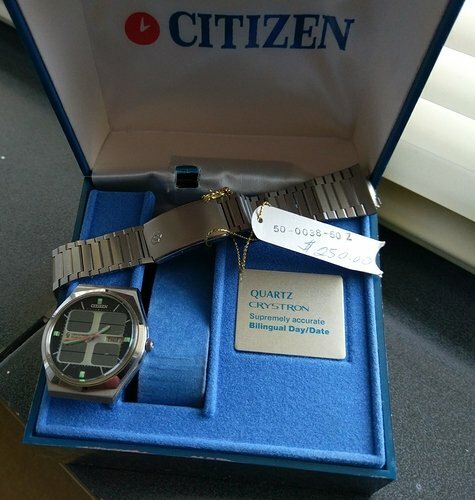 So what do You think: shall we call the Citizen Quartz 8600 movement the TRUE AND direct ancestor of the AMAZING (even today!!!) Citizen MEGA 8650A - 4 Mhz MOVEMENT ??? Last edited by cybr on 12 Mar 2018, 14:38, edited 2 times in total. And even more, the FIRST SOLAR QUARTZ watch with HANDS: Citizen Quartz Crystron Solar - 1976, have used a quite similar (derived from the year 1974/1975 8600A movement ? ) movement, the famous 8620A movement! 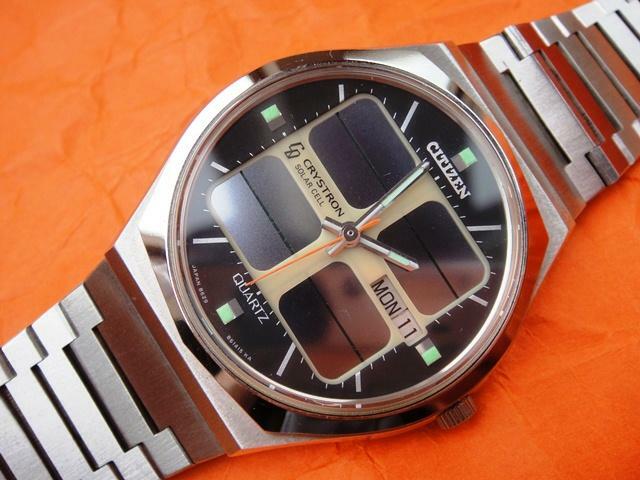 "1976 -The first watch with solar cells and hands, the 'Citizen Quartz Crystron Solar' caliber 8620A reaches the market of Japan in August. 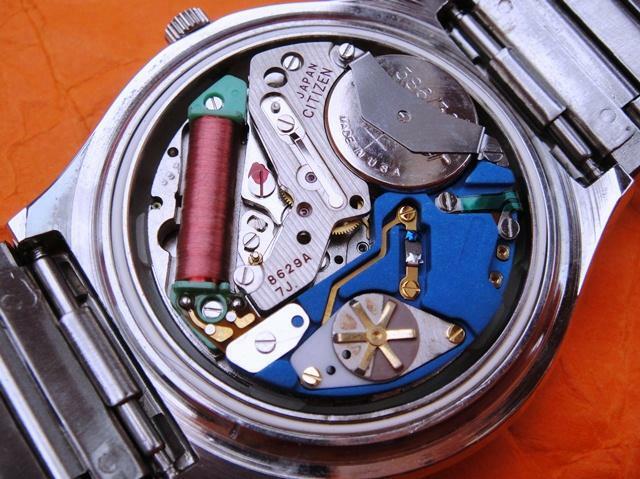 It was a normal quartz watch with four double silicium solar cells and a stepping motor. In 1974, some periodicals had already published photographs of a solar watch with hands, these are only prototypes." Funny, the watch shown on thewatchsite is still in my posession, crystal fell out again and got damaged unfortunately. I've also got some solar citizens, including this almost unused example, needing some repairs and a "lube job". dutchsiberia wrote: Funny, the watch shown on the watchsite is still in my posession, crystal fell out again and got damaged unfortunately. Otherwise, outstanding and rare watches, man!!! Last edited by cybr on 19 Mar 2018, 20:31, edited 1 time in total.